You must be 25 years old to rent this house! 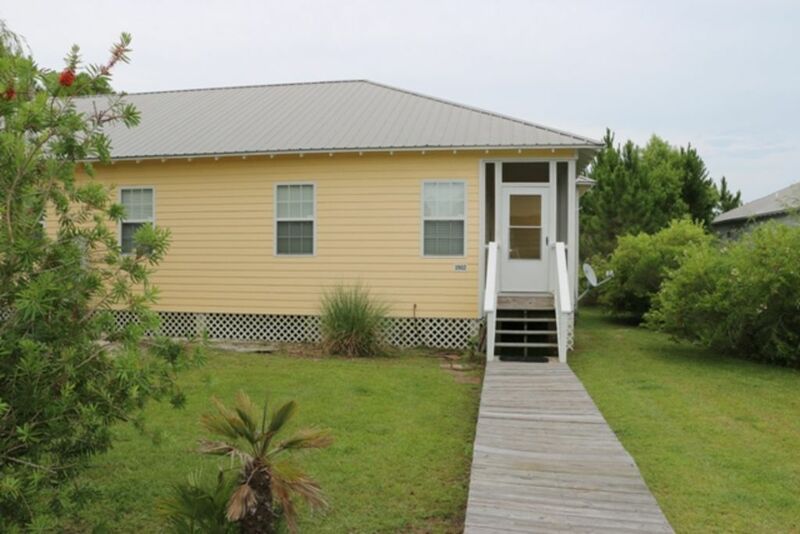 This lovely home is just a quick walk or drive to the beach -only minutes from the water. You also have access to the best pool on Fort Morgan Road and tennis courts are just a couple of minutes from your front door. This property does not offer Wi-Fi so you have the ability to tell the office, "Sorry, but I will not be to check email while I am away:)". As you walk up the stairs to start your vacation you notice the screened in porch with cozy furniture to enjoy your evenings outdoors but safely away from the bugs. There is even a table for the entire family to dine out doors on the porch. If you are looking for peace and quiet just minutes from the Gulf of Mexico, fishing, golfing, and amusement parks, the Rookery 1902 is the place for you. Give us a call to book today! We really enjoyed our getaway at this house. Everything was nice and clean when coming in, and the property grounds are beautiful and well maintained. There were a few things that could be improved such as more and better cookware in the kitchen. We didn&#x2019;t even have a pizza cutter and I&#x2019;m sure that&#x2019;s a quick go to food for a lot of people. The skillets were small and looked very worn but overall it&#x2019;s nothing that we didn&#x2019;t make do with and it didn&#x2019;t ruin our vacation! The beds were comfortable but the master doesn&#x2019;t have a tv, all other rooms do though. The living room couch seemed to be a futon but we couldn&#x2019;t find a way to lay it down so I&#x2019;m not sure why not just have a regular couch in there. Overall though we were satisfied with our stay and would stay here again. Thank you, Stephanie, for leaving a review of your stay in Rookery 1902! I am so glad that you enjoyed your time there! We will pass along your recommendations to the owner! Give us a call when you are ready to come on back down! Awesome! I am so glad you enjoyed your stay in Rookery 1902! It is a charming little house that makes you feel right at home! Give us a call when you need another vacation! Place had a comfortable feel to it. There was an issue with little ants but management came as soon as we called and fixed the problem. There were minor cosmetic flaws, but nothing that effected our vacation. Clean walkways, Beautiful pool area. Plenty of room for everyone. Rooms were bigger than I thought they would be. And the beach is close. We drove, maybe 3/4 of a mile. Beach wasn't crowded. Peaceful. All in all it was well worth it. Thank you so much!! We will be back! A little tricky at first but each got better and better,maybe a tv in the masters, i love it. Yay! Thank you for leaving a review on Rookery 1902. We hope you return next year and it's even better! We stayed in this clean, safe and very economical cottage and had a fantastic time. This was the easiest booking online I have ever done. We will book this sweet little cottage again before the years out. The pool area is very clean and only a short walk from the front door. Love, love loved this place!!! !